A strangly productive xmas day. Apart from the eating and drinking of junk and the general lounging that occurs, i built my first lego model in years that i cant count. It was the Ghostbusters car, a really geeky present to myself. So love that film and the time it came out holds some good memories. In any case the two hours (yes, 2 hrs and 100 pages), left a creative void. 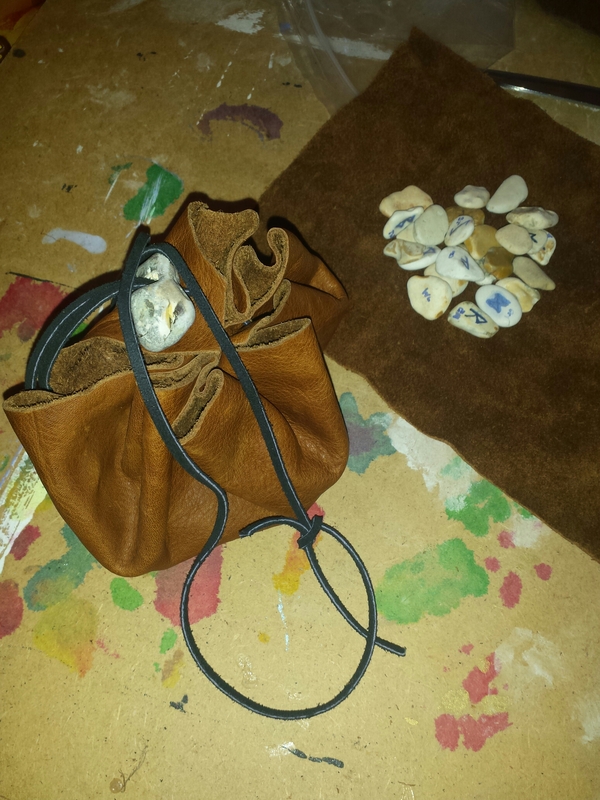 I filled that void making a draw string rune bag for my own rune set. I had them in a small velvet bag i bought in london but not been convinced it was ideal. The first thing is the pentagram on the front does not fit my craft style – never used a pentagram. And thought a surface to cast them on would be useful. So this picture is what i came up with using a rough bit of leather off cut and a spare hag stone. This really appeals to my D&D Geekiness…. The Thanet Shadow League | Bloke Called Dave. This is most funny. Just going through my blog posts that are hiding in draft and found this posting made exactly a year ago which I failed to post and it is relevant to right now too. Funny that in a way…. And a little sad. Every year Yule approaches me as if a rampaging bull. And each year I fail to engage. This year is no different I think, a combination of being in denial of a cold, work, family and failing in many ways to focus on the next book. Yule is my least favourite festival never really found a use for it, perhaps its because its the furthest from the summer you can get? As this year draws to a close I’ve spent a little time reflecting on what went on, what worked and what didn’t. There certainly were a lots of things going on this year like any other year. 1. Must finish this second book! Really need to get it out. I think I’ve added as much as i dare and need to whittle it down and shape it. 2. Next up is my labyrinth work. I can’t believe how much that strange shape has affected me (and everyone I’ve exposed it to) this year. I already have a number of workshop events for 2015 arranged and need more. 3. Revise my Second Life classes as they have been fairly static the past year or so. 4. Finally, to blog more here rather than use this as a notes dumping ground. Those are going to be my focus for the next year.